Next in the series on Papa Jay's Jerky is this Teriyaki variety. See my previous review of their Original. 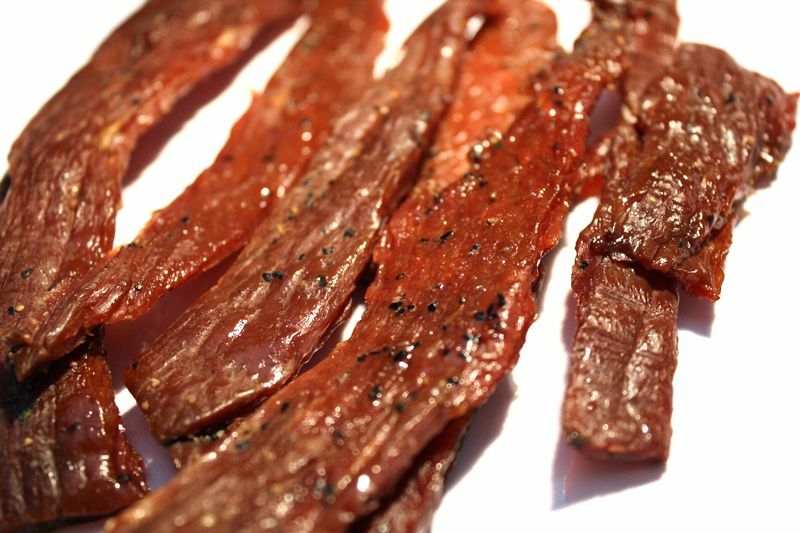 Papa Jay's Jerky is run by the couple of Mary and Richard Penrod based out of Clifton, ID. The brand was originally started in 1996 by Mary's father Jay Moyle after he retired from selling dairy equipment. Jay was big into hunting and smoking meats and bought several smokers, and finally bought a little country store in Clifton and converted the garage into a jerky production facility. When Jay passed away in 2004, Mary and her husband took over. Beef, brown sugar or honey, salt, garlic salt, worchestershire or teriyaki sauce, sodium nitrite, MSG, parsley, pepper or herbs. The first thing I taste from the surface of these pieces is a moderate sweetness, some light smokiness, and an oily flavor. There's a faint teriyaki flavor noticeable. The chewing flavor starts with a noticeable saltiness and a good deal of natural meat flavor. There's a slightly increased sweetness. For being labeled as a Teriyaki beef jerky, it doesn't quite hold up. I'm getting mostly a sweetness off the surface and in the chewing, but there's not really much teriyaki flavor in this. I'm not getting much of the soy sauce flavor you find in teriyaki, and none of the overtones of flavor that come from the mirin wine and ginger. Instead, what I get is a saltiness, and touches of the soy sauce, with lot of sweetness. Otherwise, this jerky is largely defined by that sweetness, a saltiness, and natural meat flavor with a light bit of smokiness. There are bits of black pepper easily visible on these strips, but they don't seem to add much of any flavor. The level of saltiness in this feels to be at a moderate level, though pushing towards the high end. Overall, I'm not getting much of teriyaki flavor in this jerky. It mostly comes off as a lightly smoked, natural meat flavor, with a good deal of sweetness and saltiness. These are slices of whole meat, sliced into thick cut strips ranging from two to six inches in length. 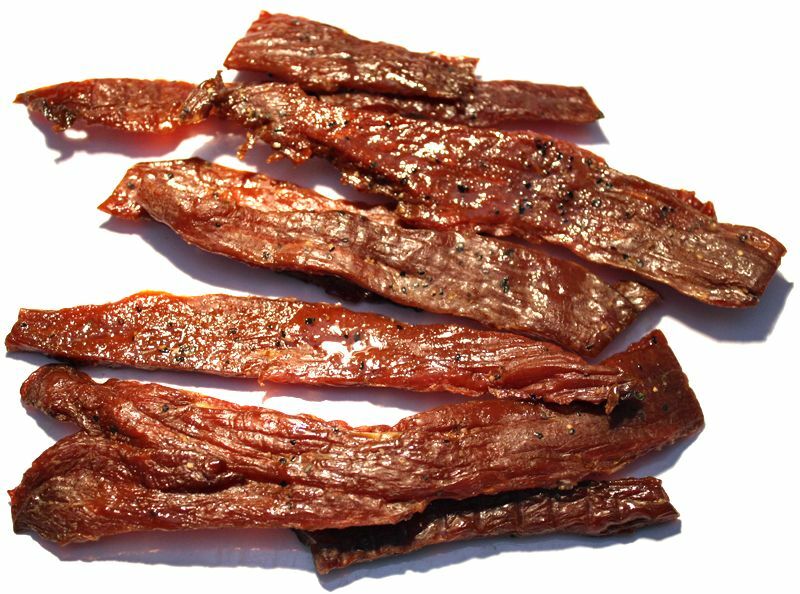 This is a dry jerky, with an oily surface feel. These strips are sliced with grain and as such are able to bend all the way back on themselves with minimal cracking. Biting off chunks requires a light degree of biting/gnawing, while chewing seems somewhat easy. The chewing texture starts out feeling dry and slightly woody. There's a fair amount of initial chewing resistance, and it seems to require a little bit of laborious chewing to get down to a soft mass. At that point, it has a meaty, fibrous, steak-like feel, but a little more dry. These strips appear to be very lean and meaty, seeing no bits or streaks of fat. I found no gristle or tendon, no stringiness, and encountered no unchewable tissues. In terms of clean eating, my fingers pick up a fair amount of oiliness requiring a licking and wiping before touching my keyboard. I found no fragments of meat or seasonings falling off. 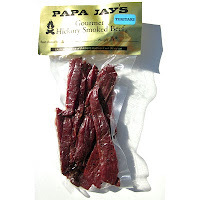 Papa Jay's Jerky sells this Teriyaki variety from its website at a price of $7.00 for a 4oz package. If you bought four packages sent to Southern California the shipping comes to $9.90, for a total of $37.90. That works out to a price of $2.37 per ounce. For general jerky snacking purposes, at the $2.37 per ounce price, it's a decent value. I'm getting a good overall snackability for a pleasing flavor, good meat consistency, and good chewing texture. Compared to major brands of jerky you might buy at grocery stores, this is a little bit more expensive, but offers a lot more snackability. As a Teriyaki variety, at the same $2.37 per ounce price, it's a weak value. I'm not really getting much teriyaki flavor in this. Instead its heavily sweet, with a touch of soy sauce flavor. This Teriyaki variety from Papa Jay's Jerky didn't really provide much of a teriyaki flavor for me, at least not the kind of flavor I would expect to get from a Japanese restaurant. Mostly what I got was a lot of sweet, and just a touch of soy sauce, but none of the overtones of mirin wine or ginger that typically separates true teriyaki sauce from sweetened soy sauce. But it's a good jerky on its own merits. It has a good tasting natural meat flavor, lightly smoky, with a good deal of saltiness. It chews like a real piece of steak, though a little more dry, and has a good meat consistency. In some ways, it's much like the company's Original variety, though more sweet on the surface and in the chewing. For my recommended beer pairing, go with a brown ale, such as Big Sky's Moose Drool, or Lost Coast's Downtown Brown.